Yes that’s me. 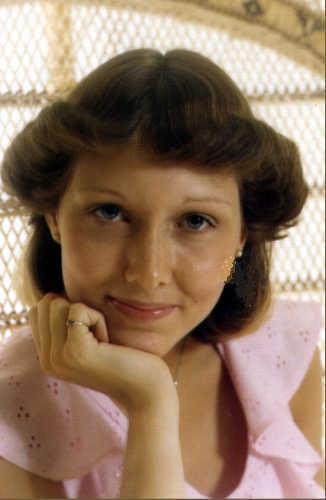 My senior picture taken in the summer of 1978 for my year of graduation – 1979. This morning I received an invitation on facebook from a former high school class mate – to join “schoolFeed” a website somewhat like “Classmates.com”. Naturally I was curious and was surprised to see many people I recognize (well, at least I recognize their names) from high school. It is a website that allows you to post pictures, interest, bio and stats, including a senior photo – so others can tell it’s really you. I’ve never been too interested in this kind of stuff before – because frankly – I keep in touch with those I want to and have never sought out the others I did not have relationship with past high school. Usually for most of us, high school is a time of dark murky waters of self-consciousness and humiliation – mixed in with some of the best times of our lives. For me – an old boyfriend or two has a tendency to pop up on sites like this and although amusing – it’s sometimes better to leave the past in the past. Heartbreaks and relationship issues – especially in high school are dicey at best. My good times in high school revolve around my musical and dramatic involvement – NOT the academic arena. In fact – I can hardly remember what I learned back them – don’t remember ever having homework but managed to pull “A’s” and “B’s” in most classes. But I remember almost every play I was involved in and every piece of music I sang in our concert and Jazz choir. But when I look back on high school – it is not with all fondness. It was an age of awkwardness, not being sure enough of myself – to really be myself and mostly a time of great regret for me personally. As one of the few Christians in my high school – I know I could have spoken up more – and tried to make more of a difference, but I didn’t. I know I did not handle a couple of situations in the right way. Who really acts in a grown-up way before the age of 18? But still – it is something I think about. I have this weird recurring dream too. I’m back in high school – can’t remember my locker combination – can find my class, etc. When I finally do find a schedule for classes – I’m in one (after roaming the halls forever) too late in the quarter and don’t have any idea what they’re talking about – and there’s a real possibility I won’t graduate. Now in the light of day this is a silly dream (if there really is such a thing) I not only graduated, but went on to be a college graduate as well. Somewhere deep down – I have the feeling of “unfinished business”. And this is something I have never been able to shake. So finding some of these people online whom I have not had a face-to-face conversation since 1979 – is surreal. Gotta love facebook for bringing past people back into our present. What we do with them is our choice. And because we can never go back – I have to believe that those circumstances, pain and regret have made me who I am today. Without them – I would not have learned how to handle heartbreak and regret, or to be able to find a long-lasting relationship – and know the difference. But I do want to reconnect with those from my past that make me smile. Those I’ve forgotten about, as they went on their way to “do life”. Share wonderful memories of fun things we did – remember teachers and events and talking about how old and mature we thought we were. But most of all – I would love to take what I know now about people and life in general – and walk those high school halls again, find those people whom I hurt and who hurt me – and make things right in person. What are your best and worst high school memories? Do you like connecting with others from your past? What would you do if you could go back with what you know now? Heard a great song on Pandora Radio yesterday sung by Joshua Payne called “Remember Yesterday” and tried in vain to find the youtube video for it! These lyrics are powerful and the music haunting. It got me thinking – as I have been a little ‘nostalgic’ in the past day or two. Oh you know what I mean – you hear something or see something and you remember. Usually it’s a great memory from something in your past that makes you smile – but sometimes it makes you sad. I kept journals in high school and still have them. As I was thumbing through them the other day I was reminded that much of me – what I was doing and thinking – is in those journals – my past. It is important to see where we’ve come from in order to fully embrace the present and then to see clearly – the future. I cannot simply dismiss events and people in my past – just because they are no longer a part of it. It doesn’t always work that way in our heart and emotions. Instead I salute those things and people who brought me to this point. And if I am a little melancholy some days – it’s okay. It means I loved deeply – and miss special people who made a difference in my life. Today is the 30th anniversary of Mt. St. Helen’s blowing its top – and it got me thinking about ‘back in the day’. Different events that ‘mark’ our lives and the passage of time. Nothing does that quite like your own children. Parents have that wonderful ability to ‘remember’ all the important ‘rites of passage’ and the other mysteries that go with raising children. When your children are little it is hard to see that ‘one day’ you will look back with fondness and even get a few wonderful and juicy little stories out of the experience. We’ve had several for both our children – but none quite like our daughter. I suppose it is because she is our first-born and our ‘experimental’ child – but she just seems to have WAY more hilarious stories than our son does. I think it may have something to do with her black and white personality and her feisty sense of humor – even as a small child she would have me in fits of laughter – so much so that I would literally have to pull the car over on more than one occasion to just ROAR with laughter! But for years there was so much more than just laughter with our children. We had a span of about 5 years where we couldn’t go ANYWHERE without one or both of our children sick on a trip – especially the airplane – and I mean SICK – you know the ‘throw up’ sick. We really felt that we were cursed on more than one occasion. It started when Ashlee was a year old and we had just resigned a youth pastor position in New Castle PA – and were moving to Seattle temporarily while looking for another ministry position. We decided it would be easier on Ashlee and me if the two of us flew and Daddy drove the moving van cross-country alone. He could go faster without a wife and baby holding him back – and I could get the baby there in a matter of hours rather than days. It seemed the perfect plan. But we drove from New Castle into Ohio and couldn’t find the airport – and we were running late. In fact when we did find the airport – Greg had to let us out at the curb and watch us go running in to the gate and had to RUN down a long corridor (with a carry on bag and a baby) to catch the small plane that was outside engines started and ready to go. Well I’m afraid little Ashlee couldn’t take the “jostling” around too much and when we were safely up in the air she proceeded to throw up all over ME. Well it was lovely. And when we got off in Chicago to change planes – I again had to almost RUN to catch the flight – barely had time to take Ashlee into the bathroom and try to clean up the mess. Oh my – it was something – and I smelled like throw up for the next 5 hours or so on the plane to Seattle. Luckily Ashlee slept almost the entire way. I don’t ever want to relive that experience. When we got there – I just remember handing Ashlee to my Mom and collapsing. When Ashlee was about 18 months or so – we were pastoring a small church in Fortuna, CA – and we were at the mall in Eureka. We had just fed her a cookie and she was smiling and riding on her Daddy’s shoulders. All of a sudden Greg said he heard a BURP coming from Ashlee and before he knew what that really meant – it was too late and she threw up all over him – in a descending pattern – down the top of his head and pouring down over his shoulders and chest. It was lovely. We were in a public place. Greg hates any attention being drawn to him – especially attention like THAT. Now you aren’t going to believe this – because after all – I AM a nurturer by nature – a huggy, kissy sort of person – for all of you who know me. But at that moment in time seeing this scene unfold before me – I thought it was the most HILARIOUS thing I had ever seen!! I couldn’t control myself for laughing HYSTERICALLY!!! Needless to say, Greg didn’t appreciate my humor – sometimes he still doesn’t get it – but hey – it was funny. Some wonderful ladies in a hair salon saw his distress and my laughter – and quickly came out with several towels to help poor Greg – with the throw up all over his face. Oh my. I wish I had had my camera on me – my iPhone would have come in very handy back then. Those kind of moments are priceless. I wish I could say that was the only time Ashlee ever threw up on me or her Dad – but sadly – it is not. She had projectile vomiting as an infant too – so you think you have ‘throw up’ stories? HA! I don’t think so! I will challenge you on it for sure! For those of you that enjoy classic rock – here is a song featured below from my generation. I graduated high school in 1979 – so you get the idea. Ah – they just don’t have music like the 70’s anymore – such a great pity. I hope you will take a moment to listen to this if you enjoy classics like I do. It will put you in a great mood! For me – it takes me back to a time a place that is no more. Not that I would want it back – I am who I am because of the experiences of the past. The different choices I made – good and bad – have shaped me and made me more experienced and I hope, wiser. But like you – I am still learning. And much of me is still the same person that I was back in high school when this song was popular. I can remember certain things, places and even smells when hearing a song from my past – it’s crazy what music can do. It’s powerful and can evoke an emotion so strong and tangible – you can almost reach out and touch it. Those places and most of those people are gone and have not been a part of my world for 30 years now – but I can still remember when listening to music. Almost any Fleetwood Mac song reminds me of my drama class – because we once had a beach party and that was what was playing on the radio. James Taylor, Billy Joel, Earth Wind and Fire, The Commodore’s, Toto, ELO, Styx, Boston, Foreigner, Starship and Elton John also remind me – and take me back to certain events – all connected with high school. And when one of the “oldies” plays on the radio or in the store – I pause, reflect and remember.